Leslie, Kevin and I were kayaking in the Delaware Bay near the ferry jetty when we saw it--a mature bald eagle just over the lip of the shore. We've seen plenty of ospreys here, but never a bald eagle. We have one resident osprey that hunts around our little patch of paradise. A moment later, we saw our osprey, laden with a live fish in its talons. The eagle saw it, too. For several minutes we were treated to a spectacular aerial show--the osprey was more agile, even with the fish, but the bald eagle was faster. The two spiraled up and up and up to the edge of the clouds, then dove down again. Another website, Stephen Caswell's travelogue, captured the intensity of the chase in both words and photos. 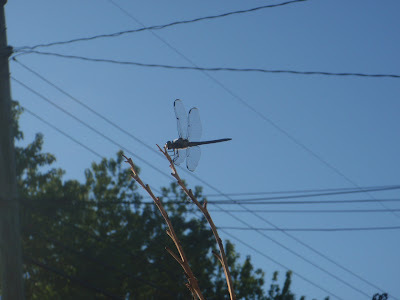 Dragonflies, like osprey, are fine hunters with remarkable vision and adept flight. Some tiny insects hatched near our home, visible as flitting glowing tufts in the setting sunlight. Two large dragonflies, each almost as big as my hands, swooped in. If you watch them carefully, you can see them catch their prey. One lit on a day lily stalk next to me. It cocked its head my way for a couple of seconds, understood I was not a threat, then went back to watching his meal. Neither story is remarkable in itself, but both mesmerizing to watch unfold. I suppose I could show a video in class, or make an interactive game where the child pretends she is a dragonfly, or have the kids plot food webs, or any number of things that pass for interactive and authentic education today. But what that child really needed was a hot July afternoon, a free afternoon, and a stoop. A glass of lemonade wouldn't hurt. The world is more wonderful than any of us can imagine--it gives back whatever you put into it, and more. While pretending to polish my curriculum this morning, I wandered over to the #LBC10 on Twitter, yet another education/technology MashCon. Like the musicians of Bremen, everyone is in love with the sound of his own voice, everyone tweeting tweeting tweeting, hoping to be validated with the retweet by another, constructing a busy world run by and full of humans. No dragonflies. No eagles. No time to reflect.